Originally published on Baseball Prospectus. Dusty Baker was fired on Friday, and few Twitter tears were shed. When a manager who’s perceived to be anti-analysis gets the axe, sabermetricians celebrate. It's about time, we think. All those bunts by position players, all those illogical lineups, all those refusals to bring in the closer with a tie game on the road. We said they didn’t make sense, and someone finally listened. Maybe Bob Castellini reads blogs! Ding-dong, the Dusty era is dead. We did it! Well…no, probably not. Most managerial hirings and firings aren’t referendums on the industry’s acceptance of sabermetrics, or the result of what anyone on the internet says. Sure, Baker was known as one of the game’s most first- and second-guessable tactical managers, and sure, he’s now out of a job. Correlation, causation, etc. Maybe Baker was let go because the Reds felt his in-game decisions and reluctance to look at certain stats were costing them wins, but it’s not the only (or even the most likely) explanation. Managers, as the old saying goes, are hired to be fired. (Baker wasn’t even the only manager let go last week.) Manny Acta, among the most openly “sabermetric” managers, has been let go by multiple teams. He’s currently an ESPN analyst. And the frontrunner to succeed Baker in Cincinnati is reportedly Jim Riggleman, who isn’t known as a particularly progressive skipper (though he’s not necessarily against new-age information, either). It’s not as if all it takes to get a managerial job post-Moneyballis to profess an appreciation for stats. There’s much, much more to the gig than that. But when Baker told USA Today “I still plan on managing” and proclaimed “I’ll be back,” I wondered whether anyone would take him up on the offer. Baker may be popular with his players, and he may, for the most part, prepare them to play hard. And that ability to inspire might be a manager’s most important quality (although it also seems to be one that expires after a long enough stretch in the same clubhouse). But it’s not the only important quality, and it’s not so scarce that a team has to settle for someone who’s below average at everything else. A few months ago, Phil Birnbaum, the editor of SABR’s By the Numbers newsletter, wrote a blog post in which he observed that in games of skill, it’s much easier to lose on purpose than it is to win. Let's suppose that you're a baseball team, and you're trying to decide who to draft. There are 29 other teams competing with you to make the best choice, but nobody competing with you to make the worst choice. That means it's hard to beat the other teams on purpose. But it's easy to lose to the other teams on purpose—just pick your mother, for instance. Baker might be among the best clubhouse leaders of men, at least until whatever influence he has on his players wears off. But in other respects, hiring him is like picking your mother to manage. It’s not a problem when your manager says something like, “On-base percentage is good, but RBIs are better.” That’s just a backwards way of expressing that it’s nice to score runs. But it is a problem when that attitude leads to batting Zack Cozart second or trying to persuade Joey Votto—who’s owed another $218 million over the next 10 years—to be a less productive player. At that point, the attitude is actively hurting the team. Here’s how that applies to managers. Analysts Chris Long and Mitchel Lichtman have independently estimated that holding all else equal, the difference between an average manager and a “strategically optimal” manager—one who makes all the right tactical moves, both before and during the game—is around two wins. When I posed the same question to several front office sources early last year, the average response I received was roughly three wins. But remember, that’s what you gain by being smart. What might you gain by not being stupid? Potentially, much more. 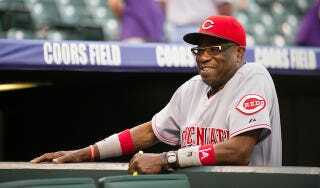 Dusty Baker isn’t stupid. But I don’t think it’s unfair to say that some things he did weren’t smart. As Birnbaum said at the Sloan Conference, “One of the things that analytics can do really well is filter out the really stupid decisions.” If Baker wasn’t on board with analytics, it probably made sense to move on, just as it might make sense to pass on him the next time he applies for a position. (Unless he adapts, which has happened before.) Replacing Baker with someone who won’t make the obvious mistake could be the easiest, cheapest way for the Reds to get better, even if it means swallowing his salary for 2014. The only reason for another team to hire Baker is if its braintrust believes his interpersonal skills are so superior to the next-most motivational manager’s that they would outweigh any wins his moves might subtract. I’m not convinced by that case. Managers will always be important, since their presence in the clubhouse means they know things a statistical model might not. But look at that Luhnow quote again. If teams are aiming to make “decisions based on the best and most timely pieces of information that you can have at your fingertips,” how much longer will they entrust that information to someone liable to go with his gut? Not a lot longer, I’d argue. Wins are worth too much for some managerial responsibilities not to be outsourced upstairs or entrusted to more strategically sound candidates. Even if a GM isn’t willing to expand the pool of potential managers to include people who didn’t play professionally, it’s not impossible to find someone can keep a clubhouse together and also be receptive to input from the front office. A team doesn’t have to hire someone as unorthodox as Joe Maddon. It just has to hire Clint Hurdle, a former player and veteran manager who agreed to implement Neal Huntington’s (and Dan Fox’s) defensive positioning plan when he was approached in the spring. It doesn’t really matter whether Hurdle was happy about it or went along with it only because his boss was behind it. Either way, the moves were made, and the clubhouse was happy. So if you’re an analytical team in the market for a manager, talk to the qualified candidates. Tell them what they’d be in for, and ask if they’re up for a collaborative approach. Some might say no, but you won’t get too far down the list of potential clubhouse leaders before someone says yes. And if you’re a current manager who hopes to hang on to his job? Do what Hurdle did. And don’t be like Dusty Baker. Ben Lindbergh is an author of Baseball Prospectus. Who Has Momentum? And Does It Matter?